If your medicine cabinet is out of control and prescription drugs seem to be creeping onto countertops and into nooks and crannies around the house, it’s time to take action and safely dispose of your stash of unwanted and unused medicines. You may think unused and outdated medicines are just a nuisance, but they can present a real danger through drug abuse or accidental overdose. Prescription drugs were involved in more than 20,000 overdose deaths in 2008, more than half of the total 36,450 overdose deaths that year, according to a recent study. If children live in or visit your house, it’s even more important to make sure the drugs you need are safely stored and the ones you don’t need are disposed of safely. Many years ago, when I was a young child, the little brother of a friend of mine got mad because we weren’t playing with him. He went in the bathroom, climbed on the toilet, then climbed on the sink, opened his medicine cabinet, and ate a bottle of children’s aspirin. Fortunately, his mother got him to the hospital quickly, and he recovered. But not all kids are so lucky. It was a lesson to me that even when you think your medicines are safely stored and out of the reach of children, some children can be very determined, and it only takes a minute for an accident to occur. A study published in Annals of Emergency Medicine reported that nearly 10,000 very young children accidentally ingested opiates prescribed for adults in their household between 2003 and 2006. The American College of Emergency Physicians, sponsor of the national challenge, suggests you inventory all the medicines in your household, both prescription and over-the-counter, and get rid of any that you aren’t using or that have expired. Forty-four states, the District of Columbia and two Native American nations are participating in the drug disposal event. Dispose of your unused, unwanted and expired medicines at an American Medicine Chest Challenge disposal site or in the trash as outlined below. Talk to your children about the dangers of drug abuse. Mix the drugs with an unappealing substance, such as cat litter or used coffee grounds. Put the mixture in a disposable container with a lid or in a sealable bag. Conceal or remove any personal information, including the prescription number, on the empty container by covering it with black permanent marker or duct tape or by scratching it off. Place the sealed container with the mixture and the empty drug containers in the trash. 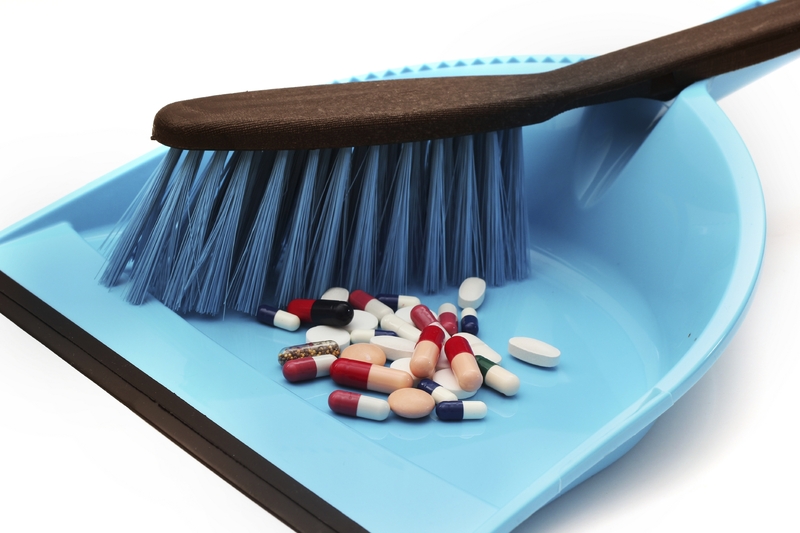 Medicines play an important role in treating many conditions and diseases and when they are no longer needed it is important to dispose of them properly to help reduce harm from accidental exposure or intentional misuse. Below, we list some options and special instructions for you to consider when disposing of expired, unwanted, or unused medicines. Consumers and caregivers should remove expired, unwanted, or unused medicines from their home as quickly as possible to help reduce the chance that others may accidentally take or intentionally misuse the unneeded medicine. Medicine take-back programs are a good way to safely dispose of most types of unneeded medicines. The U.S. Drug Enforcement Administration (DEA) periodically hosts National Prescription Drug Take-Back events where collection sites are set up in communities nationwide for safe disposal of prescription drugs. Local law enforcement agencies may also sponsor medicine take-back programs in your community. Likewise, consumers can contact their local waste management authorities to learn about medication disposal options and guidelines for their area. Another option for consumers and long-term care facilities, like nursing homes, to dispose of unneeded medicines is to transfer unused medicines to collectors registered with the DEA. DEA-authorized collectors safely and securely collect and dispose of pharmaceuticals containing controlled substances and other medicines. In your community, authorized collection sites may be retail pharmacies, hospital or clinic pharmacies, and law enforcement locations. Some authorized collection sites may also offer mail-back programs or collection receptacles, sometimes called “drop-boxes,” to assist consumers in safely disposing of their unused medicines. Consumers can visit the DEA’s website for more information about drug disposal, National Prescription Drug Take-Back Day events and to locate a DEA-authorized collector in their area. Consumers may also call the DEA Office of Diversion Control’s Registration Call Center at 1-800-882-9539 to find an authorized collector in their community. There is a small number of medicines that may be especially harmful and, in some cases, fatal with just one dose if they are used by someone other than the person for whom the medicine was prescribed. To prevent accidental ingestion of these potentially dangerous medicines by children, or pets, it is recommended that these medicines be disposed of quickly through a medicine take-back program or by transferring them to a DEA-authorized collector. If these disposal options are not readily available, it is recommended that these medicines be flushed down the sink or toilet as soon as they are no longer needed. Click here for a list of medicines recommended for disposal by flushing. For example, patients in assisted living communities using fentanyl patches for pain should immediately flush their used or unneeded patches down the toilet. When you dispose of these patches and certain other powerful medicines down the sink or toilet you help to keep others safe by ensuring that these medicines cannot be used again or accidentally ingested and cause harm.